From April 30 to May13, I had the great privilege of introducing the fabulous artist Sangram Majumdar to Israel, during his visit as the guest artist for the Jerusalem Landscape Painting Marathon. After countless correspondence, I was absolutely delighted to discover that he is even more pleasant and inspiring than I had guessed, and completely down to earth. Upon his arrival we set to work hanging a beautiful exhibition of his paintings and drawings. I was also able to watch him give a fabulous painting demonstration where he flicks paint around with palette knives at supersonic speed, and – in talking to him at length – to discover that we have very similar approaches in painting. I realised that it has been over 2 years since I have been able to talk about art and motifs with a painter, and so I immensely appreciated all the time we spent together. One of the things we have in common is that we are mostly indoor painters who tend to like chaos, mundane messes and flashes of color. 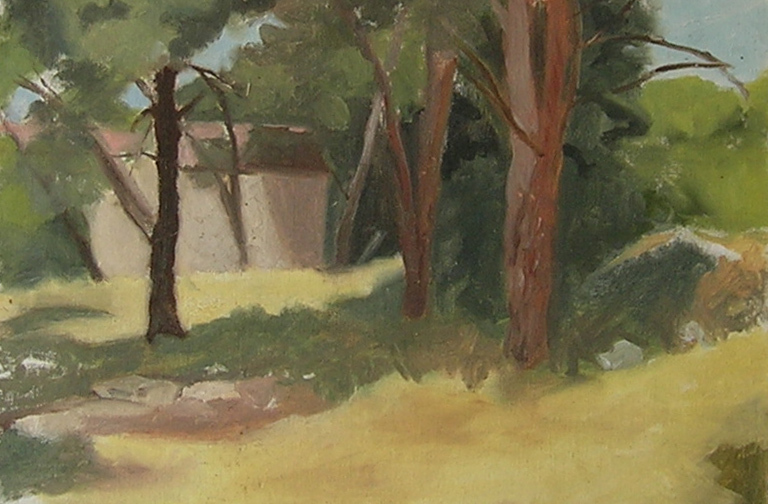 And when we go outdoors to paint, which is a very good thing to do despite preferences for the indoor studio, we stay away from pretty plein-air scenes like hills, sky, clouds, pretty farmhouse, etc. His demonstration painting subject, in fact, was of a pile of rocks, sticks and ashes, even though the setting was large, grassy and full of trees. We also both like subjects which seem a little too difficult, as it then becomes a process of trying to pin down abstract elements within a labyrinth of unrecognizable shapes. When we went to the Ein Gedi spa at the Dead Sea, we hiked with our painting gear in 90 degree weather in the hopes of finding something paintable on the weekend, away from Jerusalem. I had never been to the park, so I was not ready for the tourists, mini waterfalls, rocky cliffs and foliage. In the end we found shade under a tree, me painting the above pool looking down and Sangram painting the cliff wall in front of us. We talked about art, swapped some colors and painted for about an hour and a half before a park guide gave us a warning to pack up before closing time. Even though I didn’t really have time to push the painting further, I was happy about the viewpoint and some of the color mixtures I was able to get correct. 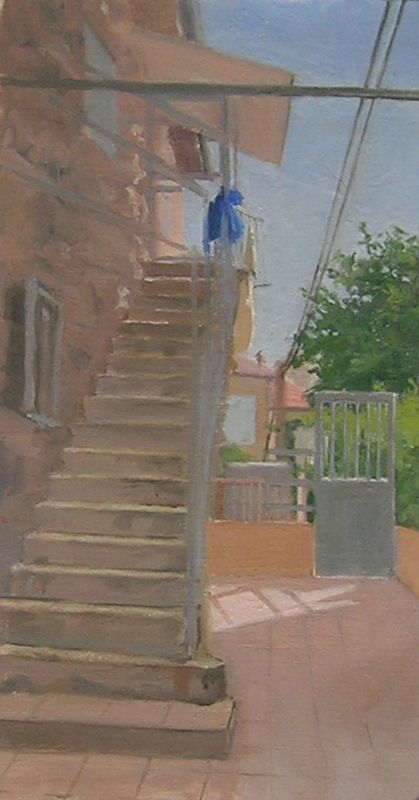 Back in Jerusalem, I was able to join the Marathon for a few afternoons, choosing a staircase in the Nachla’ot neighborhood, a study of a boulder, and a composition which included what was, marvelously to me, trees the shade of a deep pink. 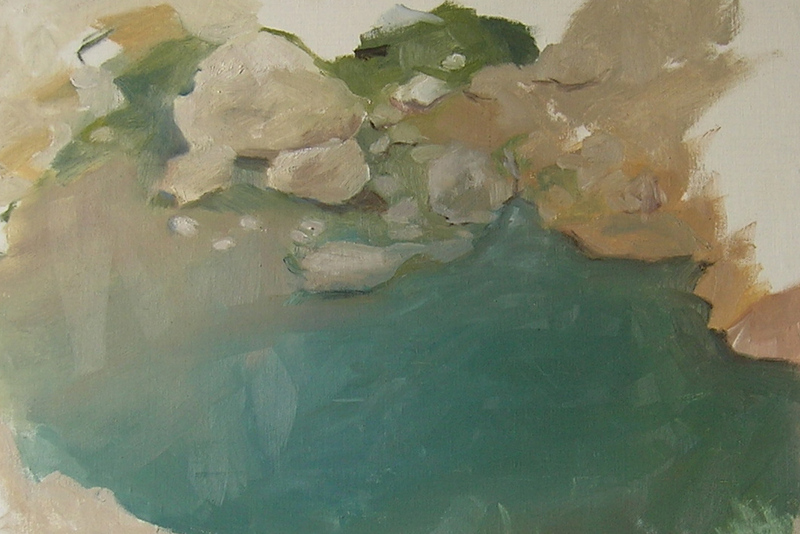 Part of the painting experience is in realising, as you are working, what colors things actually are. 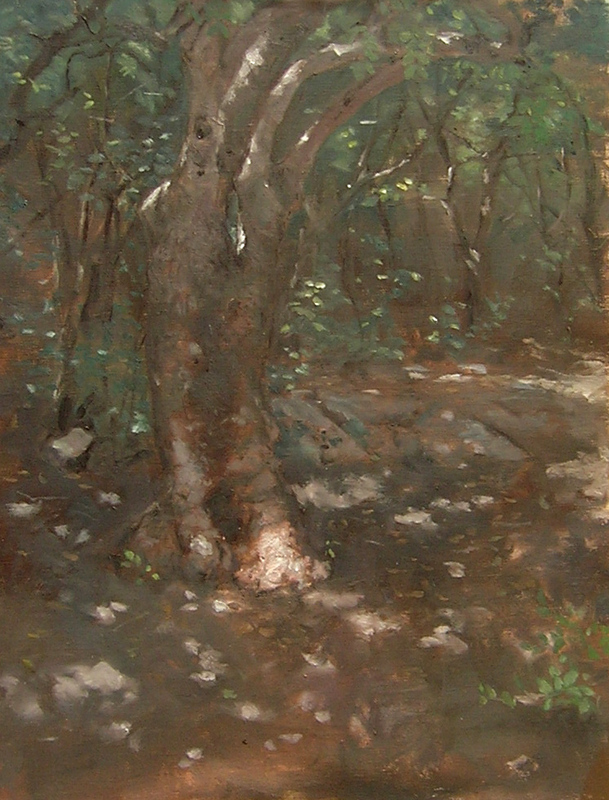 And to discover deep pink trees is one of the little eye-opening delights in painting from life. Though the painting is not finished, I appreciate it for the personal moment, and I consider it an always useful exercise of the eyes and brain. Since Sangram’s departure, I have been looking at the paintings, and though they might not satisfy or need further work, I appreciate them for the experience they provided. Back at home without the 5 hour travel time and problems of transporting wet paintings, I can squeeze a little more painting time into my day, but I am thankful for the practice outdoors as preparation for the upcoming 6 weeks I will spend in Tuscany this summer. Mostly, I am very thankful to have met a new artist friend. The process of painting can be extremely hard, abstract, and at times, feel like a dead end which can question your own merit, so it’s nice to make new friends which can immediately understand.